9,460,000 in 0.61 seconds. That’s the number of searches returned when we looked for ‘website builder’. That’s a lot of content competing for your attention! So how do you get your web pages to the top of those searches? What’s the trick? When you’re in a crowded marketplace with lots of competition, you need to differentiate your brand, starting with a little-known trick - your page titles. We’ve all read the typical page titles: HOME, ABOUT, SERVICES, PRODUCTS, CONTACT, TESTIMONIALS, PORTFOLIO, BLOG, etc. But there's a lot of room for creativity and differentiating your brand, yes, even in your site structure. Visitors are looking for unique content and experiences, and search engines like Google reward quality content, page titles, and snippets of descriptions with higher rankings. To create a website experience that stands out against all the rest, choose page titles that integrate the tone of your website and clearly describes the content of that page. Remember the page title is the text displayed in the browser title bar. Let's say you're in a professional services business. You could create a site structure that looks like this: HOME, OUR APPROACH, HOW TO WORK WITH US, SCHEDULE A CONSULTATION, and INSIGHTS. Technically each page could have similar content as HOME, ABOUT, PRICING, CONTACT, and BLOG, but the word choice of the titles changes the user's experience in a subtle, but differentiating way. Follow these three tips to create unique page titles that you REALLY DO need. Every title page needs to be unique. If you have two or more pages that have the same title or similar titles, it is difficult for users to quickly find the information they need. It also lowers your SEO ranking, so make sure each page has it’s own title. The optimal page title format is: Primary Keyword - Secondary Keyword | Brand Name. This gets you to focus on being simple and direct. Clearly identify what it is you are sharing with your visitor. Three or four may work best for a page title while eight or less applies for blog titles. Keeping it 8 words or less should help your entire title tag appear in all search result listings. For more details about title tag guidelines visit this MOZ article. https://moz.com/learn/seo/title-tag You’ll also find their super handy Title Tag emulator that will show you what your page titles will look like in search engine results. Write tags that invite the user to do something. Think about the reason a user comes to your site and offer the solution they are seeking. Whether they want recipes from a foodie site, custom videos or photography, a financial consultation, or information, make it clear what you can offer.. There's a lot of room for creativity and standing out (not to mention the SEO benefits) by re-thinking the titles for your website. Don’t feel you have to change all the page titles. Sometimes ABOUT or PORTFOLIO is the most appropriate, but if you want to stand out, don’t be afraid to try out new keywords or combinations until you get the right feel. 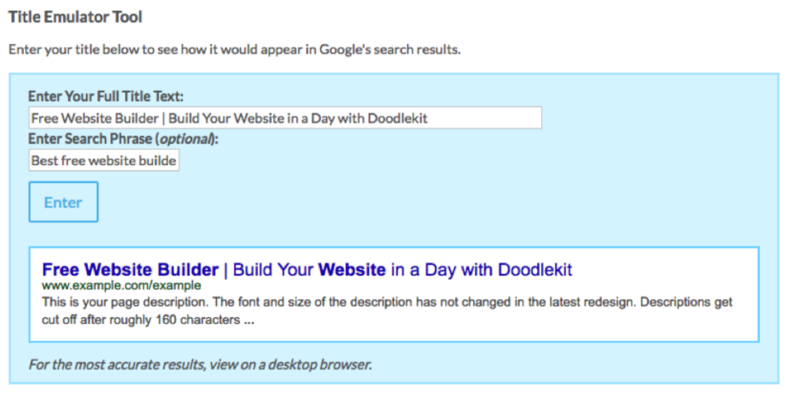 Have a comment or tip to share on your best practices for creating web pages and title tags that stand out? Share in the comments below.